After your victory against the nefarious dragon Ner'Ghal, Amber and Silver were recalled to the Empire for further official instruction by the Order of the Crystal Heart. Such training often takes years but because of their contributions and experience they were only required to take some advanced classes in preperation for their assignments throughout the Empire. You're both at the Academy in the outskirts of the Capital. The first class today is on demonology. You're in the mare barracks, you can get a quick bite first with some of your fellow paladin trainees or go to the class at once. Can't work on an empty stomach! That's a valuable lesson I learned from Iris! From the beginning you were deliberately seperated from Silver. You haven't seen him since you arrived at the Academy a few days ago. Even right now at breakfast, you don't see him anywhere. You've been given a place with the 3 other students you've been placed with. All of them are advanced students who have been together for years and you've just been placed in them. You see them in the mess hall where you've just been given a breakfast of crystal corn pudding and bread. There's Violet Spark, a (what else?) violet mare with blonde hair. She comes from the a rich family in the capital. Waving Bubble, a blue mare hailing from the new town of Granita. And Heartstone who is a resident of Rubyville, where Silver comes from. Will you dine alone or with them? Seems pretty counterproductive to separate us, but I can deal with it for a while! And of course I'll dine with them! Slam my plate down on that table and dig in! Who knows why they did? Violet, Waving and Heartstone stop their conversation and turn to you. "…hello Amber." says Waving directly. The other simply regard you coldly. "Are you ready for demonology class today? It's one of my favorites! Which kind of demons do you like fighting the most? I think my favorite demon fight was my first one, when together with some paladins in Tall Tale we ran into some Tirek demons! My first fight alongside other paladins, so exciting!" Waving grins. "They're finally going to tell us about the origin of demons, oh I'm so excited! Lord Venerate likes you Amber, I can see it. Maybe it's because you've already fought demons. What was it like? Were they scary?" "Oh they're definitely scary, but they didn't scare me! I beat them into the ground with my warhammer! You just got to have faith and the fear will fade away!" "Oh, it's that easy for the big special Amber. Of course, everything's easy for her." "Don't underestimate it Violet! I had help from two veteran paladins!" "Hmmph. You can't defeat a demon without help? I thought so…"
"Fighting demons alone isn't such a great idea, why do you think paladins come in partners? I could've probably taken them, but the risk would be far greater!" Violet snorts again and starts talking to Hearstone about the weather. Waving pouts and turns to you. "Well, I'm happy you're here, Amber! I've never met anypony before who actually fought real life demons for real!" "I'm happy you guys are here too! Eating alone is no fun!" Violet shows no response, you see Heartstone glancing at you briefly, but no response as well. But Waving grins. "Today Lord Venerate is going to tell us about the origins of demons. I'm sooooo excited." "I know! It's going to be super interesting." You join Waving to go to the class. In the Paladin Academy groups are extremely small, it's just you and the other 3 ponies, all others have already been kicked out for not being up to the task. You find yourself in a small aula in the Academy. In the center is Lord Venerate, a veteran in the fight against demons. He's a tall and handsome red pony, clothed in crystal armor. He smiles as you sit down. "Welcome students. Today it is your time to learn about the origin of demons. Tell me, does anypony of you know about the Lemarians?" Oooooh, I know Star mentioned those guys a lot but I never really understood much about it! "An ancient race of ponies that ruled the world long ago." "Excellent, Violet. The Lemarians were a society of ponies that were in direct contact with the gods, the Sun, the Moon, and Cadance. Just like we are directly communicating with Cadance." "What makes them so different from us then?" "They were a different race of ponies. They were all alicorns, with horns and wings. But they were dedicated to the Sun and the Moon mostly. The Crystal ponies are very in tune with their emotions. It shows in our aura. It is for this reason that we are the favorite of Love and Cadance." "Oh! so they were just better than us?" "Perhaps to the Sun and the Moon, but not to Cadance. And it turned out to be our success and our doom, for the Crystal Empire was uniquely resistant to the Chaos of Discord, but not to Sombra." "Oh right, Discord couldn't touch us!" "Exactly, during Discord's reign, magic and the very world was topsy turvy. But the Crystal Heart protected us from all of that. All of us are always under the protection of the Crystal Heart, this is something the demons want us to forget because they know the power of the Crystal Heart could defeat all of them." "How could we ever forget about the heart! It means everything to us!" "Amber, you've faced demons before, tell us about it. What did you feel during that?" "A huge urge to smite them out of this world!" "What you were feeling was the duty of the Crystal Heart. What all of you must understand is that a single pony is not enough to defeat any demon. To do so, you need authority. Only a pure connection to Cadance and the Crystal Heart, which in a way makes you like Cadance and the Heart, can defeat them." "So only paladins can defeat them?" "Only those pure of heart. You do not need to be a paladin to be pure of heart. But a paladin will usually be in the best position to be so. Now, it is time for you all to understand where demons come from and why they are so hard to eradicate." "Now, you all know about the Moon, the Sun and Love but do you know where they come from?" Violet again raises her hoof. She must be pretty smart, I'll let her answer! "Exactly. Before there was the Crystal Empire or anything, there was the Void. A big empty place. 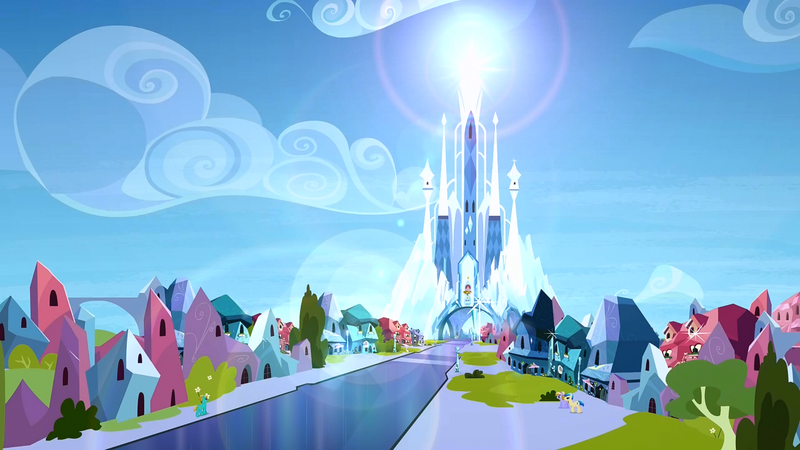 But the Sun, the Moon and Cadance wished to improve the place!" Keep listening, this sounds important! "Now imagine this. A large black plce without animals, or ponies or plants, or love, or smiles! That's what the Void was like. But Cadance, the Sun and the Moon decided that this was not enough, and so together they created the world we live in now. Full of happiness and joy. And the Sun and the Moon rose up into the sky to make sure the Void could never seep in completely. Every day, they fight a battle to protect us from the Void!" "Why does the void want there to be nothing?" "The Void is a place of constant change, in a way it's very similar to Discord. It cannot stand the very concept of a place that remains the same. True, for us ponies the world changes constantly, but for the Void this place has been inert for millenia." "Why can't it just ignore us?" It is from the Void that Tirek and the other demons came in the darkest of times, before the Sun and Moon decided to guard the entrance. The Void has infected the whole world, even us."